Click the image for a wide field display. Celestron C11 @ ~f/10.48 (2930 mm fl) 1.265 arcsec / pixel. LumHa (HaR)GB combine. 50% of H-Alpha data was combined with the Lum and Red channels, using the Photoshop lighten option. 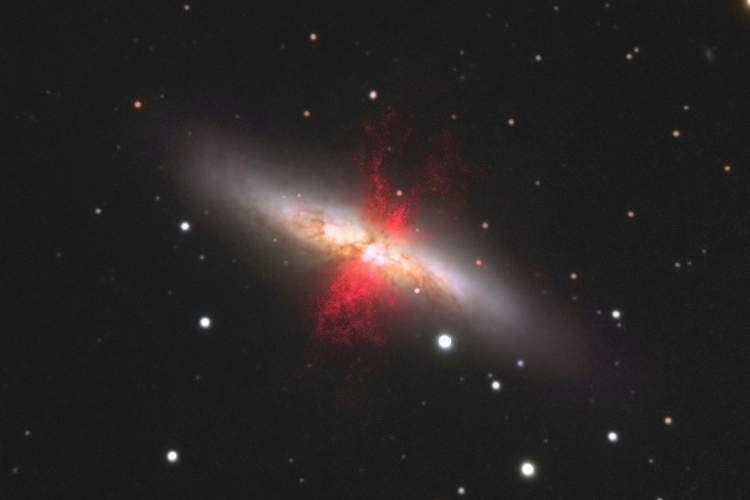 M82, the Cigar Galaxy, was stirred up by a recent pass near the large spiral galaxy M81. 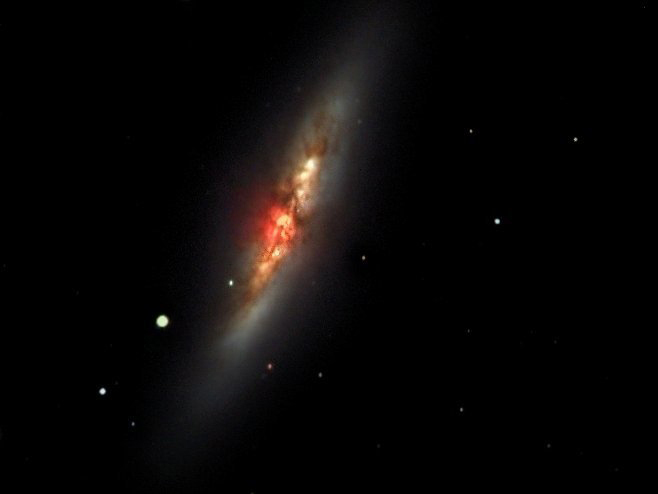 However, this doesn't fully explain the source of the red-glowing outwardly expanding gas. Recent evidence indicates that this gas is being driven out by the combined emerging particle winds of many stars. This image highlights a specific color of red light strongly emitted by ionized hydrogen gas, showing detailed filaments of this gas. The filaments extend for over 10,000 light years. The 12-million light-year distant Cigar Galaxy is the brightest galaxy in the sky in infrared light, and can be seen in visible light with a small telescope towards the constellation of Ursa Major.